The school boasts a large sports hall which is fully marked up, able to be hired as section or full hall, has great lighting systems and sprung flooring. The sports hall is ideal for 5 a side football, netball, basketball, korfball, futsal, badminton, cricket and many other sports. There is also a main hall for hire which features theatre style seating which can be stored away or brought out for use under request. The hall itself is fully fitted with stage lighting, projector with big screen, heating/air conditioning, exellent sound systems, performance area with surrounding curtain. 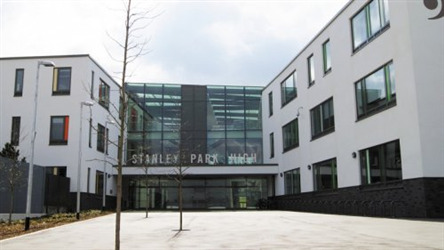 Other facilities available to you include classroom spaces, changing facilities, cafe area, atrium/dining area, library, fitness suite, toilets. The school grounds features a fully floodlit astroturf pitch. The pitch is fully caged and is a full-size 11 a side football pitch, the pitch can be split for smaller games if need be with goals provided. The full-size pitch can cater for football, hockey, tennis, netball, zorb football and other training purposes. Also available for hire are cricket nets as well as a 4 lane running track which is ideal for triple, long, high jump, shot-put, discus, javelin. The facility comes complete with any sport equipment that may be required on request. This venue is ideal for corporate events, sports days, training and matches.